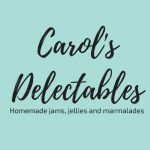 Carols Delectables very own apple pie in a jar. Only made with our fresh Arizona apples. Slightly warmer than our jalapeno or red jelly, it’s for pepper lovers who like a little more zip than our jalapeno but not the intensity as our habanero. If you enjoy lemon meringue pie you’ll love this marmalade that bursts with zesty lemon flavor. In addition to spreading it on toast, muffins, pound cake, desserts, it’s great with fish, chicken, so many things. Our tiny orange- like citrus makes an amazing marmalade. It’s rich, sweet and tangy flavor has a slight essence of apricots.